Widely compatible with iPhone Samsung Android Smartphone, iPad, Tablet PC, Car and Home Audio Music Streaming Sound System, A/V receivers. This adapter cannot control volume, Control the Volume over the phone or control the volume on the car audio. Ugreen Bluetooth 4.1 Receiver device could be used for your headphones,home sound system,car stereo and portable non-bluetooth device ,so you can listen music or make phone calls with ease. FEATURED BLUETOOTH V4.1+EDR: Class 2 technology makes this bluetooth receiver a minimal energy consumption. It Support A2DP/SBC/MP3/ & AAC,EDR protocol. With over length receiving distance, it can reach up to 10m in open space without block. COMPATIBLE DEVICES: This Wireless Bluetooth Audio Receiver for home stereo works with most devices with Bluetooth functions like iPhone, iPod, iPad, Tablets, Other Smartphone, most speakers, TV, and radio, easily plugs into any powered PC speakers, Car & Home Stereo Sound System and A/V receivers using 3.5 mm jacks. 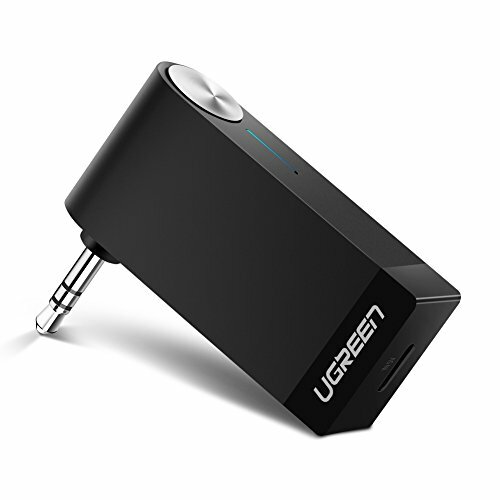 BUILT-IN MICROPHONE: Ugreen wireless bluetooth 4.1 receiver audio adapter makes talk to family and friends a breeze. Perfect for hands-free calling when driving. Extra-long built-in battery provides up to 4 hours playing time and only need 1.5 hours to charge it fully. PORTABLE: Ugreen Wireless Music Adapter comes with the mini size 50 x 40 x 14.3mm, ultra-compact . Easy to carry with, and won't add much bulk to you. Important Note: Please charge the Bluetooth Audio Reveiver with Standard DC 5V USB Power Adapter or Car Charger. Any charger with higher voltage output is NOT allowed and may affect the product performance.